16x8GB memory. Sure it’s not the newest, or greatest, but it’s nice to be able to right size the RAM on all my lab crap, and now have all kinds of extra RAM. The machine is built around SAS, but I don’t have the right sled adapter, and only a single disk. Although it really doesn’t matter as there is a really nice internal USB slot inside this Dell r710, and VMWare installs just fine onto it. I already had all my virtual machines on an external NAS so it really didn’t matter. I’ll probably either get more sleds and SAS disks, or some kind of flash PCIE cards. I haven’t really decided yet. 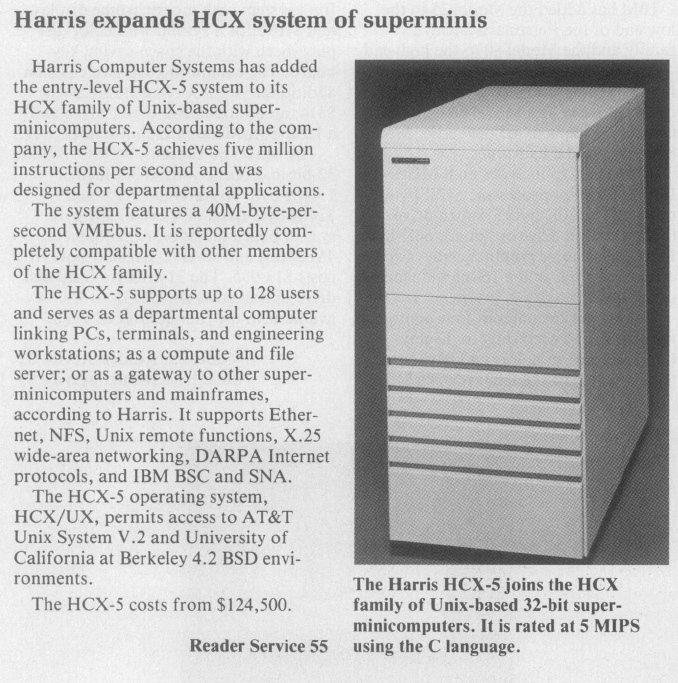 It’s crazy to think of a time when 128kb was a lot of memory, let alone 1MB, or even a monstrous 16MB. It seemed crazy to hit that 24bit limit of the 286, then the 32bit limit of the 386.. At least we are a ways off from hitting the 64bit limit, but now that I have work servers with 1TB+ of RAM, well, it’s only a matter of time. 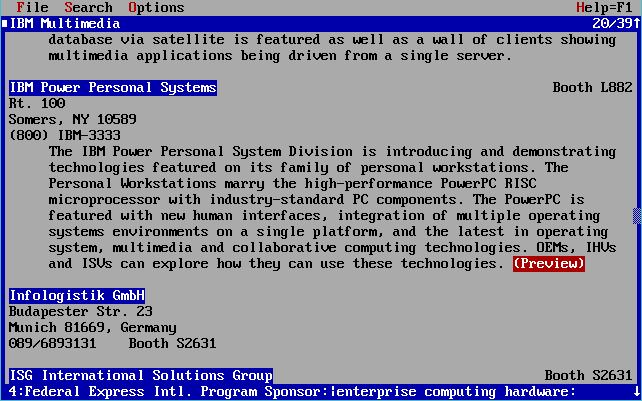 Long before websites, during the dark ages of the BBS, on the internet there was (well it’s still there!) a distributed messaging system called usenet. There are countless topics on just about everything that was full of all kinds of incredible conversations. Before the walled gardens, and the ease of running individual bulletin boards, the internet had prided itself on having one big global distributed messaging system. 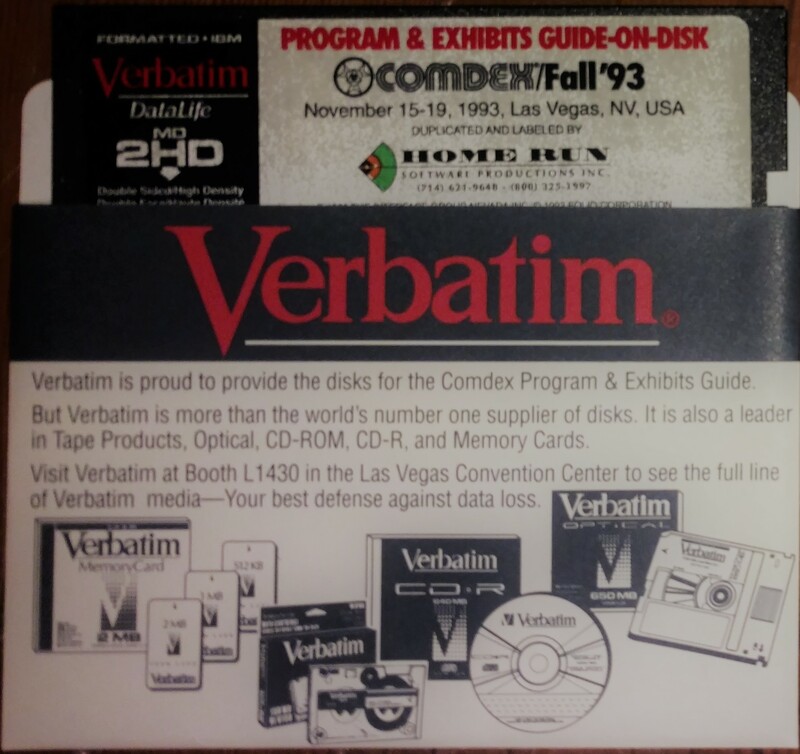 It was a big system, and one thing that was always taken for granted was that it was too big to save, and that whatever you put out there would probably be erased as all sites had a finite amount of very expensive disk space, and they would only keep recent articles. But it turns out that in the University of Toronto, in the zoology department they had a tape budget, and were in fact archiving everything they could. 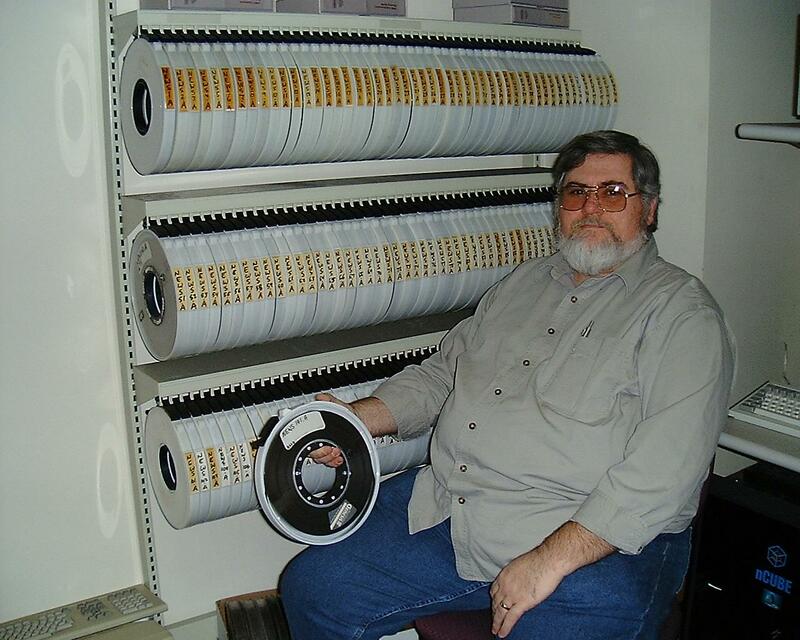 In all they had amassed 141 tapes spanning from February 1981 (though these are not Usenet posts, just internal netnews University stuff) all the way up to about midnight of July 01, 1991! While the archive was made available to a few people in 2001, it was made generally available in 2009, and then in 2011 on archive.org where I downloaded a copy of it. There is some interesting backstory over on Dogcow land, as it took quite a bit of effort to get the data from the tapes, and then slowly released out into the wild. This is a collection of .TGZ files of very early USENET posted data provided by a number of driven and brave individuals, including David Wiseman, Henry Spencer, Lance Bailey, Bruce Jones, Bob Webber, Brewster Kahle, and Sue Thielen. 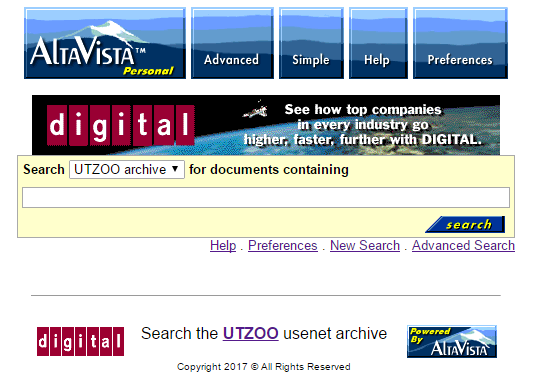 OK, so back a few months ago, I had setup AltaVista personal desktop search along with the UTZOO usenet archive for the purpose of using something more sophisticated than grep, but maintaining that legacy/retro feel us using outdated technology. To recap the first challenge is that the desktop search product, is only meant to be used from the desktop of a Windows 98/NT 4.0 workstation. It uses a super ancient version of JAVA as the webserver, and they chose to bind it to 127.0.0.1:6688 . So the first thing to get around that was to build a stunnel tunnel allowing me to effectively connect to the webserver remotely. And since the server assumes it’s locally I had to use Apache with mod_rewrite to setup some simple regex expressions to massage the pages into something that would be usable from a non local machine. So with that word salad up, let’s have a brief picture! So as you can see it’s really simple it looks for the string ‘altavista.superglobalmegacorp.com’ in the host header, and then sends it to the backend that has a single web server, in this case a lone Debian server, aptly named debian8 that throttles after 10 concurrent connections. The next thing to do was generate a SSL self signed cert, which wasn’t too hard. The stunnel installer has a profile ready to go, so it was only a matter of finding a version of OpenSSL that’ll run on NT 4. As this isn’t public encryption I really don’t care about it using crap certs. On the Debian server is where all the regex magic, is along with the stunnel client to connect to the NT 4.0 Workstation. With the ability for the Debian box to talk to the AltaVista web server, it was now time to configure Apache. This is the most involved part, as the html formatting by AltaVista personal search is hard coded into the java binary. However thanks to mod_rewrite we can modify the page on the fly! So the first thing is that I setup to virtual directories, the first one /altavista maps to the search engine, and then I added /usenet which then talks to IIS 4.0 on the Windows NT 4.0 workstation, which is just allowing read & browse to the usenet files that will need to be indexed. #Redirect the root to the /altavista path. And now the site is starting to work. The most involved regex is to change the links from local text files, into a path to point to the usenet shares. This changes the text for u:\usenet\a333\comp\33.txt into a workable URL. Naturally there is a LOT of these type of statements to match various depths, and pattern types as there is A news, B news and C news archives, plus scavenged bits. Additionally I disabled a bunch of URL’s that would either try to alter the way the engine works, or allow the search location to change, just giving you empty results, along with altering some of the branding, as digital.com doesn’t exist anymore, and various tweeks. The finished config file for Apache is here. Now with that in place, I can hit my personal AltaVista search. The next insane thing was to rename all the files from the UTZOO dump adding a .txt extension, and then re-encoding them in MS-DOS CR/LF format. I found using ‘find -type f’ to find files, and then a simple exec to rename them into a .txt extension. Then it was only a matter of using ZIP to compress the archives, and then transferring them to Windows NT, and running UNZIP on them with the -a flag to convert them into CR/LF ASCII files on Windows. This took a tremendous amount of time as there are about 2.1 million files in the archive. 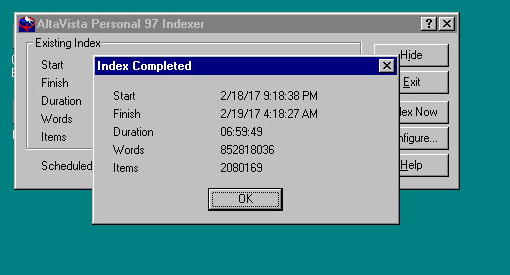 Now with the files on Windows, now I had to run the indexer. Indexed in under 7 hours! While I had originally had an IIS 4.0 instance on the same NT 4.0 Workstation serving up the result files, I thought it may make more sense to just serve them from the UTZOO mirror server I have in the same collocation so it’d be much faster, so that way only the queries are relying on servers in Hong Kong, instead of being 100% located in the United States. If you are hoping for the wealth of knowledge to be gained from people posting on usenet from 1981 to 1991 then this is your ticket. Keep in mind that usenet being usenet, there is discussions on everyone and everything, and like all other forums before you know it it’ll end with calling people Hitler, and how the Amiga is the greatest computer ever (well it was!). A tip when searching by year, is that people commonly wrote the year as 2 digits. However when looking for numbers like, say Battletech 3025, it will pull up files named 3025.txt. To prevent this just add -3025.txt to stop names like 3025.txt, or if you want to find out about the movie Bladerunner from 1982, try searching for bladrunner 82 -82.txt +review +movie. If you have any questions, there is of course the manual with a guid on how to search. While the story of AltaVista is somewhat interesting, but much like how Digitial screwed up the Alpha market by trying to hoard high end designs, they also didn’t set the search people free to focus on search. And the intranet stuff was crazy expensive, look at this ad from 1996 which translate to a minimum of $10,000 USD a year to run a single search engine! But as we all know, the distributed model of google won search and AltaVista never had a chance as it was caught up in the Compaq/HP mess then spun out to be quickly absorbed by Yahoo. Meanwhile it appears the original owners of altavista.com, AltaVista Technology, Inc. of California, are actually still in business. If anyone cares I’ll put the installation files, and some of the config’s in this directory. So if you can read this, then the server is working. After a few errors here and there, it appears to be working now.  Hopefully this clears up the phantom ‘logging in’ issue others were having. Also I haven’t seen any php5 updates on Debian 7 in a while, so it was time to dump the DB, and copy over into a new VM. Thanks to Battler, leilei, John Elliott, Mahod, basic2004 and ecksemmess for contributions towards this release. 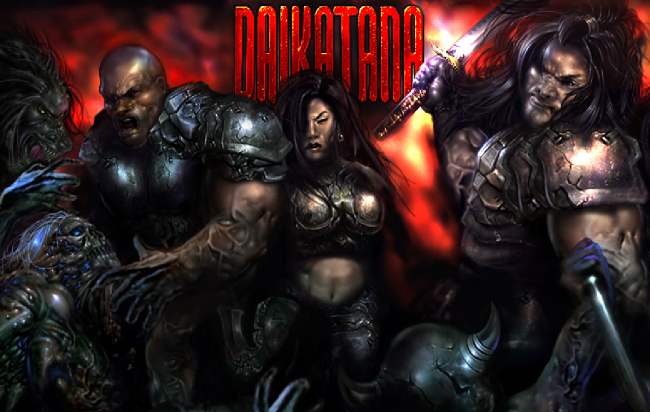 No, really I got an email today from Frank Sappone, that his passion project the fixing and overhaul of Daikatana was written up on PCGAMER. 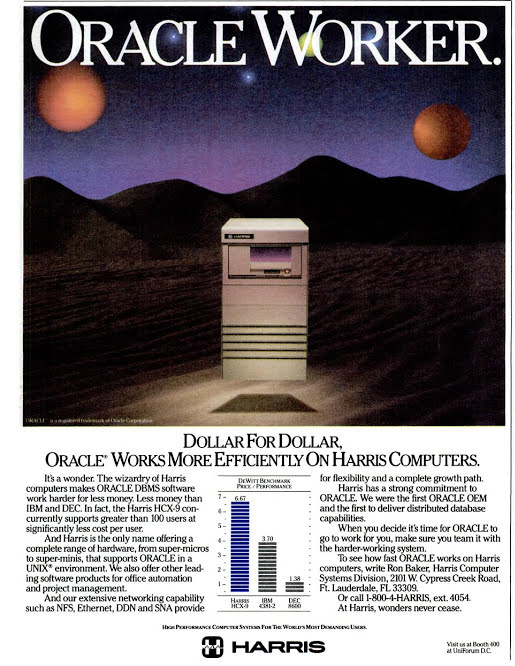 Although my involvement may have gotten edited down, honestly all I did was give that little bit of a push and inspiration that it could be done by spending a good week on installing Solaris, and porting the dedicated server portion from SPARC Solaris, to x86 Solaris. 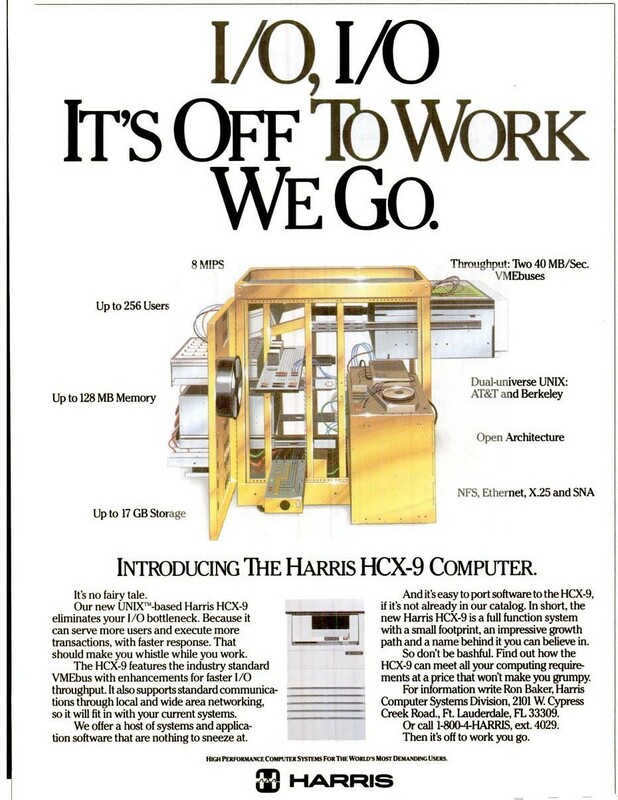 Once we had it running there, it was far easier to then get it running on Linux and OS X as a dedicated server. Once we had that push Frank was able to use his great knowledge of Quake/QuakeWorld/Quake II and fix an incredible amount of bugs, and bring it into a fairly good state. The real star here is of course the Johns, John Carmack for making the source code to Quake/QuakeWorld, Quake II, open so we could always refer back to this code, which Daikatana was based off an early beta of Quake II, and John Romero for giving us the needed source to make it all possible. It’s on sale right now at steam! If it asks if you would like to overwrite any files, do so and overwrite the files. End result is that when Daikatana starts you can see in the right bottom corner of the red area in main menu “1.3” instead of “1.2”. You’re also able to access for example the HD resolutions from the Video menu. Turns out that it’s basically missing from the includes. Thanks to this hint, just simply add this into your source/header after pulling in winsock2.h and it’ll link. And now you can happily compile and link. I saw this floating around on some web site… And I thought I’d take a look! 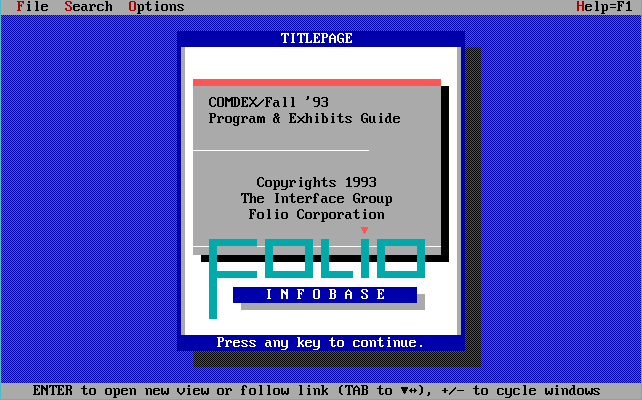 Well it’s exactly what it sounds like, an ancient MS-DOS text base database from the fine folks at Folio who would later on sell off, merge and become part of LexisNexis. And what fine things were there in 1993? Let’s not forget the false hope and promise of the IBM/Apple/Motorola PowerPC that was going to save us all, and give us the grand unifying microkernel OS of them all, PINK. The IBM Power Personal Systems Division is introducing and demonstrating technologies featured on its family of personal workstations. The Personal Workstations marry the high-performance PowerPC RISC microprocessor with industry-standard PC components. The PowerPC is featured with new human interfaces, integration of multiple operating systems environments on a single platform, and the latest in operating system, multimedia and collaborative computing technologies. OEMs, IHVs and ISVs can explore how they can use these technologies. Yeah, as we all know Windows NT for the PowerPC wasn’t a thing until late 1995, then killed off in 1997, Solaris saw a single release, MacOS stayed hybrid 68000/PowerPC until the acquisition of NeXT, and then was the basis of Rhapsody/OS X 1.0 and then OS X 10.0 . 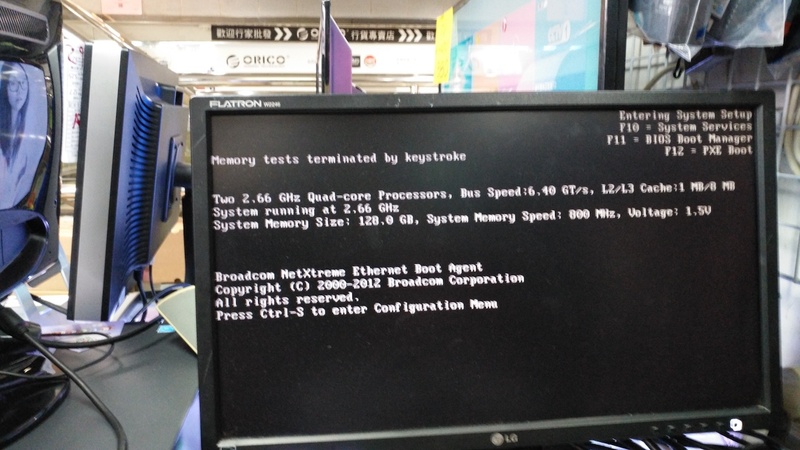 A/IX easily transitioned from the POWER to the PowerPC, while OS/2 only went as far as a limited beta, and PINK/Taligent just never happened. Although thanks to hard ware assisted virtualization (VT-x/AMD-V) it really didn’t matter as we can run pretty much whatever OS we wish at pretty close to native speeds. The line between Type-1 & Type-2 hypervisors has been blurred to the point of really not mattering anymore. Using GCC 4.1.2 because that is what I wanted. 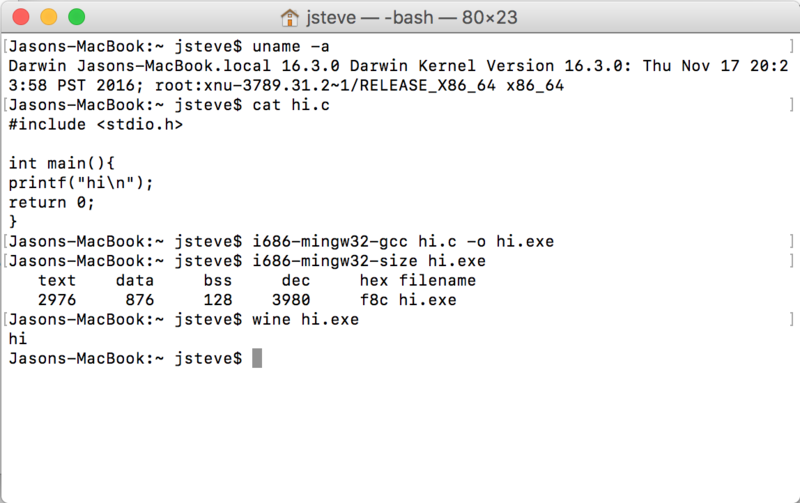 It’sGCC 4.1.2 for MinGW on OS X. Naturally I had some fun along the way. When gperf wasn’t installed, the compilation script ran the command anyway but generated a blank ./gcc/cp/cfns.h. Since this file was newer than the source (./gcc/cp/cfns.gperf) the makefile left it alone and never regenerated the ‘real’ file when you actually had gperf. To continue, run rm ./gcc/cp/cfns.h and try again. to dealing with duplicate inlines exact_log2 from an include gone wrong. Not to mention more and more headers not generating. But in the end it actually works. As always it feels so much faster to run on OS X than Windows. I’m sure there is stuff out there for newer versions of GCC, but I wanted to use the older toolchain and libs for some other reason. As always it’s on my site here: OSX_16.3.0-MinGW_GCC_4.1.2.7z but I don’t think the world at large would even care.